Posted 11:13 am by Daytona Aircraft Services & filed under ADS-B, Avionics Solutions, Daytona Aircraft Services. Posted 9:45 am by Jake Clemens & filed under Daytona Aircraft Services. Posted 12:24 am by Daytona Aircraft Services & filed under Daytona Aircraft Services. Posted 5:50 pm by Daytona Aircraft Services & filed under Daytona Aircraft Services. 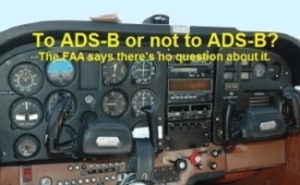 What is ADS-B and How Does it Work? Posted 9:09 pm by AMC-Staff & filed under ADS-B, Daytona Aircraft Services. Posted 5:25 pm by Daytona Aircraft Services & filed under Avionics Solutions, Daytona Aircraft Services, Press Announcement. Posted 7:57 pm by AMC-Staff & filed under Aircraft Maintenance, Daytona Aircraft Services. Posted 10:18 pm by Daytona Aircraft Services & filed under ADS-B, Avionics Solutions, Daytona Aircraft Services. Posted 3:19 pm by Daytona Aircraft Services & filed under ADS-B, Avionics Solutions, Daytona Aircraft Services.